We chose a sunny autumnal day to explore this magnificent Col du Grand Colombier, which secured a higher profile since 2012 when The Tour de France cycled it for the first time, the same year that fellow Brit Bradley Wiggins was in the yellow jersey. The Col du Grand Colombier is a mountain pass and the highest summit (1501m) at the southern end of the Jura range of mountains in the department of Ain, Rhone Alps in France. We drove up from the village of Culoz which sits on the right bank of the river Rhone and this was the very route taken by the Tour de France in 2012. This became evident by the faded names of the cyclists including ‘allez, allez, allez or go Wiggo’ that had been sprayed on the road. 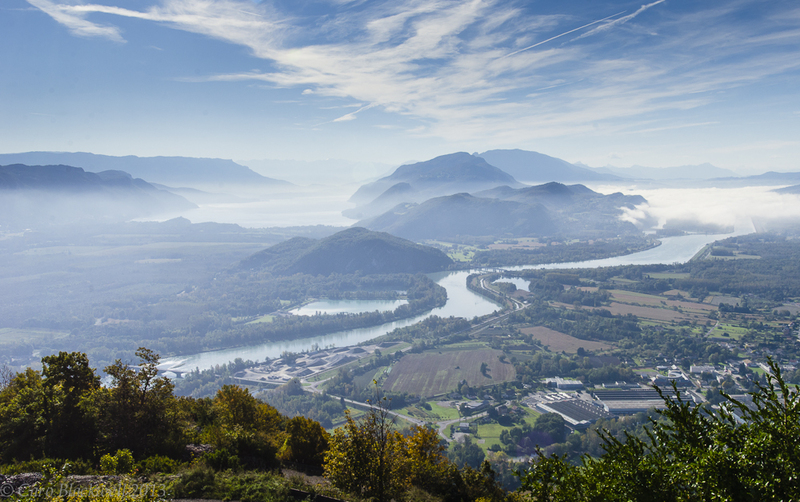 The drive up afforded us magnificent views of the Valley of the Rhone meandering below and of Lac Bourget. The undulating hills and countryside below as far as the Alps including Mont Blanc clearly visible, if a little hazy. We arrived 2 kilometres from the top to be greeted by a welcome sign ‘Auberge du Colombier’ so after checking we could reserve a table for lunch (priorities!) we then parked the car and walked on the ‘off road’ trail up to the summit. This proved to be quite a hike, not very long but very steep and more like rock climbing! With 2 dogs and a strong wind this proved quite a challenge. However, there is the more sedate route of following the road up to the top either on foot, by bike or in the car. Col du Columbier – nearly there! However you choose to reach this summit is up to you…but seriously this summit is worth reaching. The views are breathtaking of the Rhone river, the gorge of Val-de-Fier, Lac Bourget, the Alps including Mont Blanc. You have a 360-degree panorama of a huge area below, on a clearer day you are supposed to be able to see the three lakes of this area: Lac Leman, Lac Annecy and Lac Bourget. There are many signs for walking trails both on the way up to the top and around the top. Ok back to the Auberge du Colombier. This is a quaint traditional style mountain restaurant. Very casual and Savoyard in style with an open fire in the corner, dark wood furnishings and walls adorned with traditional hunting and agricultural implements. 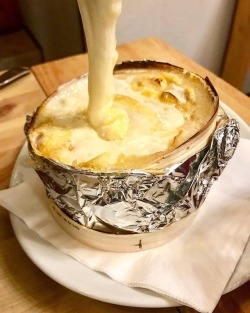 The menu included all the usual Savoyard food; Diots, various salads, omelettes, charcuterie, escalopes, faux filet, and several lunchtime only menus to choose from ranging from €20.90 – €29.00. There is a menu available only in the evenings which has raclette, fondues and braserades on. There is a plat du jour at lunchtimes and on Saturday it was Civet de Sanglier – Wild Boar stew with Polenta gratinée followed by Tarte Myrtilles. The wine list included local wines from Maison Angelot – these are known as the wines of Bugey. The Gamay de Bugey was very drinkable and a good light red for lunchtime. I found this Gamay from Ain was very similar to the neighbouring Savoie Gamay wine. I chose the plat du jour of wild boar stew which was a good rich stew with a red wine sauce. My one observation was a slight texture to the meat, I have since made a wild boar stew of my own, which I shall be posting on here very soon and the texture of the meat was quite different, so I concluded that their dish may have been frozen. This was accompanied by a polenta gratinée and a redcurrant jelly. I would have liked a green salad or some vegetables with it. We were not given any bread with our meal, which is quite rare in France. The food was good and the service was friendly and I imagine in the summer sunshine it would be wonderful to sit out on the terrace enjoying the great views over the Alps and Mont Blanc. It is advisable to book a table and please note that they do not accept credit cards, so make sure you have enough cash with you!! 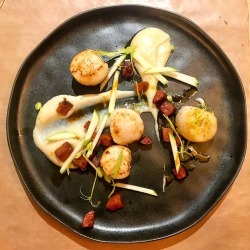 Auberge du Colombier, Culoz Tel 04 79 63 73 26. I would definitely like to go back and discover a few more of the hiking trails on and around this Col (not sure I’ll ever be fit enough to take my bike!) and some of the other local restaurants in Culoz, Anglefort or Artemare. Also would be fun to seek out the local vineyards and try more wines from the Ain region.